yes, here is my book again! what a CUTIE!!! Anna from Cummings, GA! Comment #167 (out of 356 comments) was chosen LIVE on Facebook today by the dashing Stephen Orr, author of Tomorrow’s Garden and Executive Garden Editor for Martha Stewart Living. I decided that Steve should choose the winner, so that there would be NO QUESTION that all of those lovely comments coddling me would make me partial. The lucky random winner, Ann is a mentor to over 50 kids, teaching them to become Master Gardeners, and she is vowing to share the wealth. BRAVO! This was SUCH a fun giveaway, and I was very proud to have sponsorship from some very wonderful people at both Timber Press and Peaceful Valley Farm & Garden Supply (find them online at GrowOrganic.com). Candace at Timber has been a dream, and Charlotte Daffodil-Planter Germaine is my champion at Peaceful Valley. 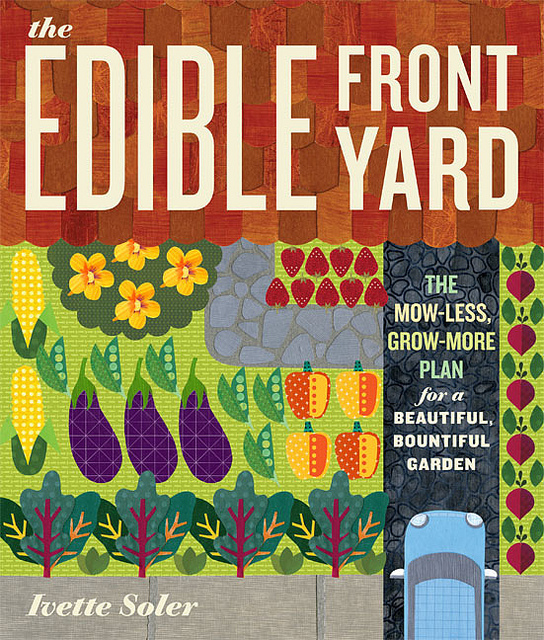 I am so happy that The Edible Front Yard stood alongside Sugarsnaps and Strawberries, a wonderful book written by my dear friend Andrea Bellamy, whom I admire greatly. A big thanks goes out to all of my online friends who facebooked and tweeted about the giveaway – Carri Stokes, Teresa O’Connor, Genevieve Schmidt, The Yarden, and all the rest. A special shout out goes to Sharon Cohoon from Sunset Magazine, who is always an enthusiastic supporter! And GUESS WHAT? Peaceful Valley Farm & Garden Supply / GrowOrganics.com was SO excited by all of the interest in the giveaway that they decided to do a special, limited time offer! They are selling The Edible Front Yard AND the Supermodel Seed Collection for a super low price!!! Go over and look at these seeds – they are beautiful warm and cool weather edible wonders – they are the epitome of ornamental edibles. I am thrilled that they have done this – it was a little idea I had and they went and made it all real and everything! I was tremendously moved by the comments – I was woo’d, I was petted and purred at, a poem was written for me, and so many people shared their Edible Front Yard Dreams. I want ALL of those dreams to come true! The energy behind this idea is amazing, and I know that very soon the thought of someone being cited or threatened with jail for planting food in their front yard will be a thing of the past! We can all change things if we band together and DO IT!!! Congrats Anna! I know you will enjoy the treasure … send me a picture of the cartoon when you hang it! I want to see it in its home! congrats anna! what a wonderful way to start your weekend! Congratulations to Anna, who will be doing good work with the prizes! This has been such a fun week for us at Peaceful Valley/GrowOrganic.com, working (who am I kidding? PLAYING!) with Ivette, and Candace from Timber Press, and Andrea Bellamy. And it’s more than fun, hoping that we are all encouraging edible gardens in lots of front yards.